The 2010 Gulf of Mexico disaster, which resulted in several deaths and 3.19 billion gallons of oil leaking into the ocean at a cost of 3 million per day, prompted the introduction of new safety legislation for the offshore drilling industry in the US and Europe. The new legislation stipulates increased levels of inspection of flexible riser pipes, the failure of which were identified as one of a variety of errors contributing to the disaster. Inspecting flexible risers isn’t straight forward. 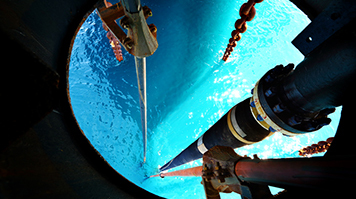 They are complex, armoured, multi-layer, underwater structures, and in order to rigorously monitor their integrity, Non Destructive Testing (NDT) techniques are used. Techniques such as RiserSure™ a radiographic NDT developed by TWI Ltd uses a novel subsea radiography detector to penetrate all the layers in the riser pipes. RiserSure™ is able to perform deep, high quality inspections to help improve safety, reduce leaks and minimise downtime, which will save the industry 270 million Euros over five years. A 24-month long project currently underway at London South Bank Innovation Centre (LSBIC), funded by London South Bank University and Horizon 2020, aims to optimise the operation of the technique from its current technology readiness level (TRL) 6 up to TRL9, at which point it will be sold to NDT service providers and asset operators. RiserSure will reduce the environmental impact and improve the safety of offshore production. It will improve the profitability of operators by reducing leaks and downtime, saving the industry €270 million over five years. RiserSure will allow subsea engineering contractors to offer new high added value radiographic inspection services. One RiserSure unit could monitor 135 risers on a three year cycle - enough for several floating platforms (depending on their size and complexity). Benefits to the consortium partners will be obtained by RiserSure generating revenue from sales of new equipment and provision of after sales product support in the form of software and hardware maintenance and servicing, repairs and training. One partner intends to provide a service for subsea riser radiography, with an installed fleet of 15 Risers.